Looking for a simple, convenient, and cost-effective storage solution that allows easy identification, access, and retrieval of items? Visible storage boxes are an ideal solution for enterprises and environments where quick access to stored items is of great importance. Visible storage boxes are made out of clear plastic, allowing quick access to items, especially in a facility that stores different types of working materials and equipment. They can be used at home, in garages or sheds, offices, institutions, retail shops and warehouses. 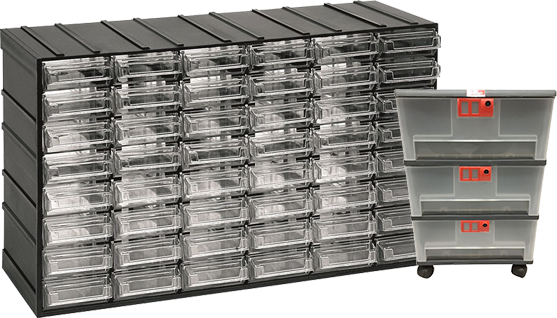 Some are larger than parts bins, these storage boxes can be used to store medium size items that cannot be stored in parts bins. Labelling of boxes facilitates easier retrieval of stored products. If you have shelving units in your storage facility, you can use them as storage units for visible boxes. Systems such as adjustable pallet racking allow storage of different sizes of boxes as they can be adjusted to incorporate different storage needs. Otherwise, these boxes can also be stacked against a wall and maximize on available storage space. Visible storage boxes are made of high quality, durable, and unbreakable plastic material which is easy to clean and maintain. These boxes are an ideal and cost-effective solution for storage of small and medium sized items.